Another season in the work of our Order has passed. The lessons we have endeavored to inculcate are appropriate to all the walks and seasons of life. 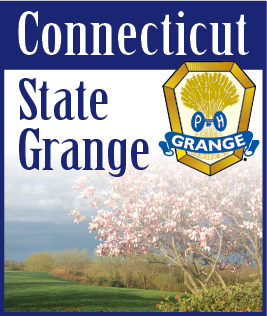 We are all getting ready for the 133rd Session of the Connecticut State Grange, October 19-21. This year some changes have been made to the schedule so please carefully read the forms and schedules. We hope to make this year a great success, but we need your help to do this so please come out and attend. The New Pomona Granges are meeting with the mentors, so every member should attend their meetings to answer questions you may have and to get the organizational schedule for the forming of these three new Pomona Granges. Everyone has a say in the goings on of the new Pomona Granges so don’t sit out and complain later. National Grange’s 151st Annual Convention in Spokane, Washington will soon be here in November. This year is election of officers and will try a new one day shorter Convention. We hope that the fires in the area are contained as to not “smoke-out” the area we will be in. Prayers for Grangers in these areas, whose homes and Grange Halls are impacted by this unusual fire season. As we start a new year we must all have a serious conversation as to how we can attract young members to our Order. Our “This is how we do this” attitude is not working. We have to find a way to spark the interest of the younger generation to help us grow. I know that today young people rely heavily on electronic devices and systems. They also look for quick gratification, not requiring hard work and lengthy hours. They also tend to have a short attention span if they are interested, then they are here, but if not then they are off to their electronics to satisfy themselves. There must be something that we can organize to engage everyone in a common goal. So during State Session, let’s make this the discussion during our off time and to see ways we can achieve this goal. Hope everyone had a successful Grange year and let’s start working for the next year.